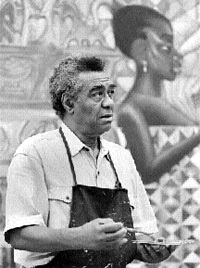 Artist John T. Biggers (1948 graduate) was the subject of a major traveling exhibition, The Art of John Biggers: View from the Upper Room, in 1995. The exhibition was curated by the Museum of Fine Arts in Houston, Texas. Most of his world-renowned art (murals, paintings, sculptures, and prints) depicted African American culture and history. Biggers also painted the murals in Burrowes Building at Penn State’s University Park Campus.